Two days ago I did a new bios update on the notebook. The process worked fine as usual and, again as usual, did not fix or improve the issue with the fan noise. After 36 months with it I have to bear it for only 12 more months until the notebook is due to refresh. A positive note about the 6430U: it does no longer trigger the security scanner in the Ben Gurion airport. Whatever the chemical that was there it is now completely evaporated. When I was 11 I had my first programming training. 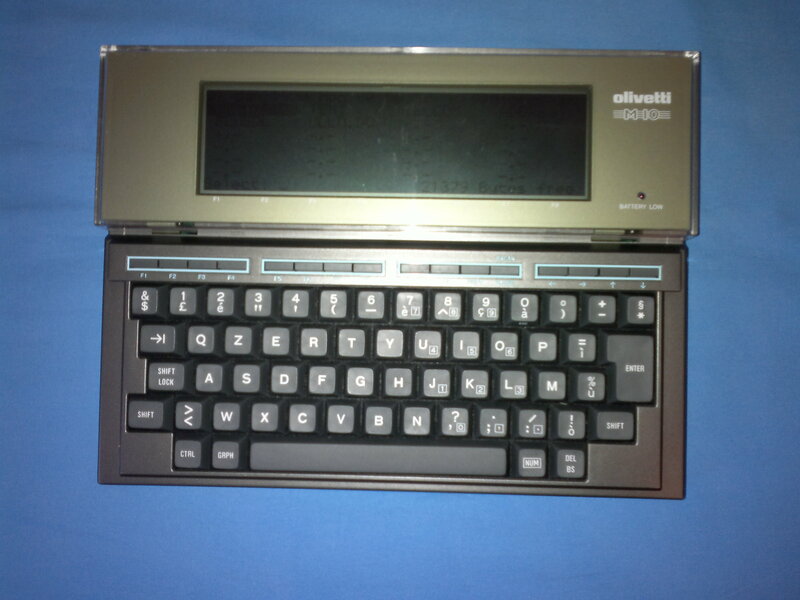 At the time computers were still a fairly esoteric subject in Italy, but my school had the opportunity to get a few Olivetti M10 when they were introduced and offered the opportunity to the students, on a voluntary basis, to be trained to use the systems. 30 years later I’ve decided to buy a piece of my computing history and now it’s part of my collection of old hardware. After living for quite some time with the wi-fi built into the ADSL modems (I have two lines at home) I’ve decided that the signal needed some improvement to work reliably with the Nexus 7. The design is unconventional and the size was surprisingly small when I got it. The installation manual is relatively fat but it’s only because it covers a dozen different languages: the actual content is quite skinny; this fortunately is not an issue as the setup, once connected to the web interface, is really easy to do. Signal improved significantly on the Nexus 7: from 1-2 tabs with some occasional complete disconnection to 4 bars (out of 4) with few drops to 3 bars. Also the Nokia Lumia 800 and E7 both have shown a significant improvement in signal quality. The Acer 3810T was already working fine with the older solution: this is likely due to the larger radio antenna and greater available power. The device can be used also as a wi-fi to ethernet bridge to connect a single device implementing in an easy way what I did using OpenWRT and to extend the wi-fi range, but I’ve not used it in this way. Overall I had a very positive experience and would suggest this device to anyone having a need like mine. This week I’ve made a few experiments with the video streaming capabilities of my DS411Slim NAS with two mobile platforms: a Nexus 7 (Android) and the Lumia 800 (WP 7.5). In order to proceed I had to install the beta version on the NAS as a first step, then I was able to connect with the app downloaded from the stores of the two devices. I only had a handful of old AVI movies to test and it turned out that the native player of both the Lumia and the Nexus 7 were unable to play the format. On the Nexus 7 it was possible to install VLC and then play the video. The same possibility is not available on the Lumia making it an unsuitable platform for further experiments. The app on the Nexus is not able to resume the play from the point where the tablet was suspended and apparently doesn’t support the manual seek. I’ve downloaded locally the file and VLC seek worked without any issue. Overall the experience was fairly negative: DSVideo is not yet a mature solution. Recently my Nokia E7 died and I was left without a smartphone. Given the nice feeling that I’ve had with the Nokia N9 I’ve picked up the Lumia 800 handset as the phone construction is very similar and the N9 was not longer available at a good price. After one week of usage I’ve to say that I’m very unhappy with the phone because of the Windows Phone 7.5 operating system. There it is no way I could find to download automatically (or by explicit command) all the email attachments for all the emails in my inbox. I travel in foreign countries 50% of my time and I’m not always in free wifi coverage: having all the data in the phone up to the last synchronization time is key to make it a good work companion. The position of MS is that the behavior is selected to avoid risks of infections and to help save bandwidth: I’d agree with the choice if it was just the default configuration but it’s not changeable at all. I’ll either hand the phone over to my wife or send it back hoping that I’ll get the E7 back from service soon as the physical keyboard is a big deal too for me. Early in the monday morning I picked up my E7 to use it for both phone calls and as a GPS for my trip in Germany and I’ve found a bad surprise. For no apparent reason it was asking me to insert the USB cable and then to disconnect the device no matter if I had or not something connected. Acknowledging it was not helping: in a few seconds it was back with one of the two requests. I’ve tried all the possible combinations suggested in this thread on nokia.com, but nothing worked. December update: I got it back fixed under warranty. Horray! Enter your email address and press the button to receive automatic notifications of new posts by email.